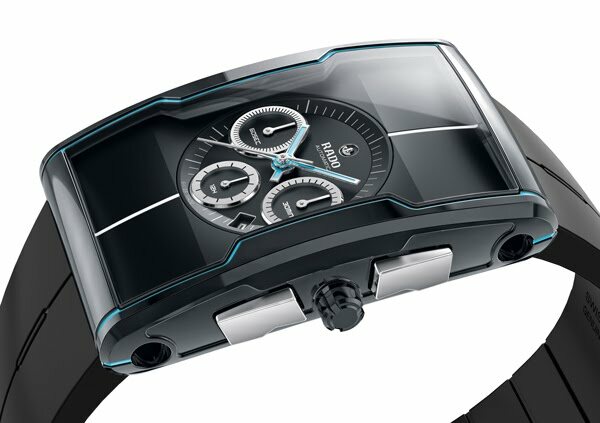 (Lengnau, Switzerland, March 2012) – In the new Rado R-One Limited Edition, Rado propels watch design well out of the orbit of tradition and convention. Its dramatic shape, inspired by intergalactic travel, houses an unusual combination of high-tech materials, signed off with icy blue detail. The appearance of the finished chronograph resembles a picture of the earth’s atmosphere taken from space. Silver-coloured metallic and icy blue luminous detail shimmer against a profound and mysterious black background. Three round chronograph discs characterise the dial like perfectly formed planets, legible signatures of the futuristic theme. Each of the 300 pieces that make up the limited edition comes in its own wooden presentation box, mirroring the watch’s shape and protecting it like a time capsule. Viewed from any angle, the Rado R-One is the shape of things to come, exploring exciting new design territory.